Ditch your lawyer career and follow your dream to become a chef. "The game play is familiar with a twist. Mary's story is engaging and enjoyable as she goes about finding her calling and herself. It has all the fun of the Delicious series along with a deep and engaging story. I highly recommend this game." Mary works at a large law firm, and being a real Vanderworth, her parents expect Mary to have a successful career as a lawyer. The only problem is Mary feels that she has a different calling. She loves cooking and wants to become a chef. Will Mary have the courage to stand up for herself and follow her heart? In Mary le Chef: Cooking Passion, you'll enjoy 60 restaurant levels and 30 extra challenge stages across six charming chapters. Prepare 70 different dishes and upgrade your restaurants and menus as you watch a wonderful story unfold. Mary le Chef is just like the Delicious Emily games. I absolutely love all those games and this one as well! Love it! I want to spend all day and night playing it. I hope there will be a part two. I am a huge fan of the Delicious Emily games, and Mary le Chef is quite similar. It's very cute with a nice original story. The gameplay is about what you'd expect. I found it to be very enjoyable and would recommend it to anyone who likes Time Management games! I bought this game because it is from the creator of Delicious Emily. The game is so much fun and I give it 5 gold stars. Would recommend it to all my friends. This game is a lot like your general food time management games. But it is really a lot of fun! 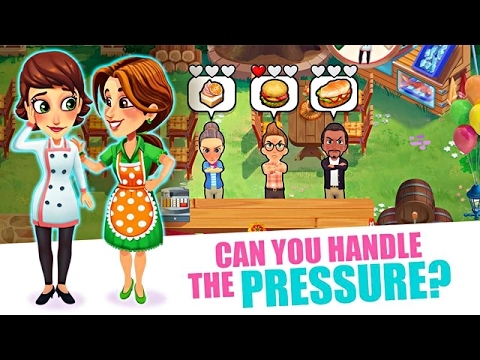 if you like any of the Emily games, Cake Mania or anything food related, you will love this game! I get so tired of the haunted, dark and scary Time Management games. This one is happy just like the Delicious franchise, mouse and all. Only made it through the first section, but so far I'm hooked! This game was awesome and a must buy. If you like the Emily Delicious games, then you will love this one. There were some levels that were a little tough to master, but with a little determination it can be done. I really enjoyed it. I loved this game so much that I will be purchasing it. I enjoyed this game. It is like the Delicious Emily games and I like those very much. Can't wait for the sequels of both games to come out. This time management game is a lot of fun. It has smooth play and the characters are great. Give it a try. This game reminds me of Delicious Emily's games and I really enjoyed playing it. When I first started playing it, I thought they had just copied the Delicious: Emily series. Then realized that it must be in conjuncture with that game series because Emily is in it. If you like the Emily games, you will like this one as well. Loved this game. Bright and colorful. I was glued to it. Will play over again and again. A game for all. If you enjoy Delicious games, then you will enjoy Mary le Chef. It has lots of levels and a fun storyline.